It has been another rainy and overcast day, similar to the last few weeks of rain...and to think that I was concerned about the dry weather we were experiencing earlier in the Spring season. The fields are now saturated and there are flooded areas in many fields. The forecast is calling for sunshine tomorrow and Friday with temperatures in the high 20's (celsius) so hopefully it will dry up again. After a busy morning of running errands and doing groceries, I enjoyed a quiet afternoon of browsing through my library basket goodies and catching up on some novel reading. As we are heading into summer which will officially arrive next week, my thoughts have gone to summer activities including beaches, picnics and other family outings. 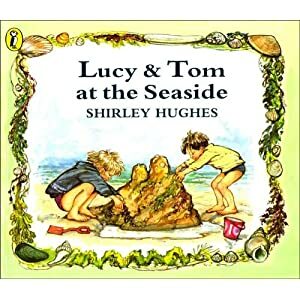 Although I don't live near the sea, I just had to share some of my favourite children's seaside-themed books with you. Below is one of the books I ordered from the library and as soon as I saw the title, I suspected that the book might be written by a british author. The names she has chosen, Tom and Lucy, are such british names and I discovered after reading the publication that I was correct in my assumption. Shirley Hughes is an author/illustrator born in Wirral, UK, in 1927, and is known to have written over 50 children's books, many which were a series including this one. 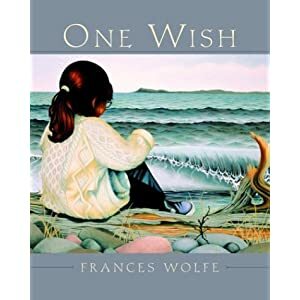 The illustrations are so detailed and inviting, and the seaside is captured well with descriptions of a beautiful picnic, train ride to the seaside, seagulls, seaweed, shells, and sandcastles. 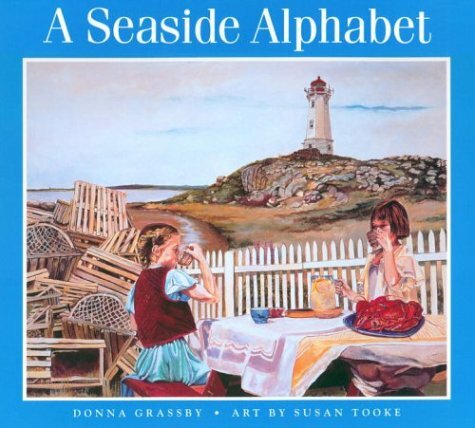 The Seaside Alphabet is a collaboration by author Donna Grassby who grew up in Nova Scotia, Canada and illustrator Susan Tooke originally from New Jersey and now residing in Halifax, Canada. "Whether it's a treasure hunt on Jewell Island, Maine; a sunny afternoon on the rocks at Peggy's cove, Nova Scotia; or a bracing dip in the waters off Prince Edward Island, the seaside offers fun and adventure." I wished for a cottage by the sea. 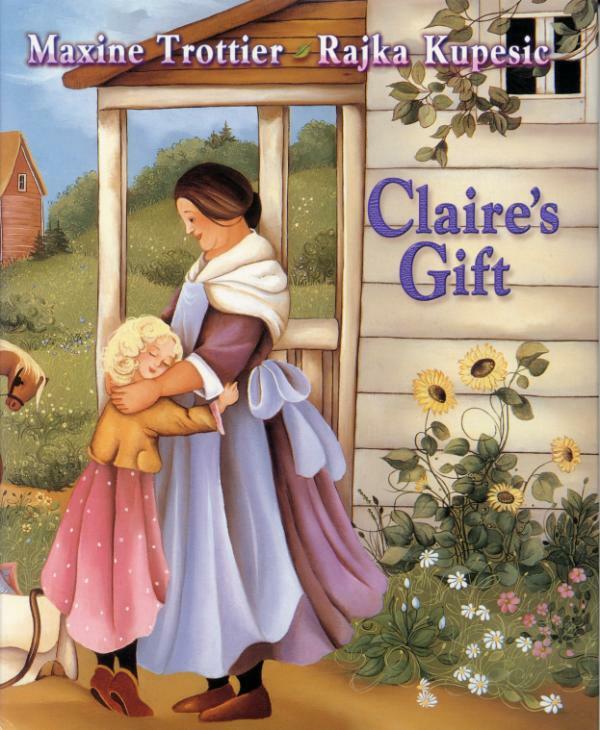 Claire's Gift is a heart-warming story of a summer spent by the sea, in the tiny village on Cape Breton Island where Claire spends time with her Tante Marie and learns to hook rugs as is the custom for the ladies in Cheticamp. The rugs are created with beautiful soft wool, adding delicate flowers and vines. 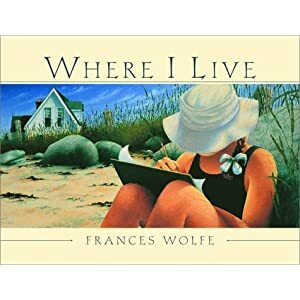 Written by Canadian author Maxine Trottier from Newfoundland, and illustrator/artist Rajka Kupesic from the Toronto area, who does oil on linen in a unique style making her internationally renowned and loved by art collectors. She has exhibited extensively across Canada, the U.S.A. and in Europe. Her paintings hang in museums in addition to private and public collections around the world. In Rajka’s own words. “My art is a celebration of life in all its beauty. Art should be our escape from the mundane. 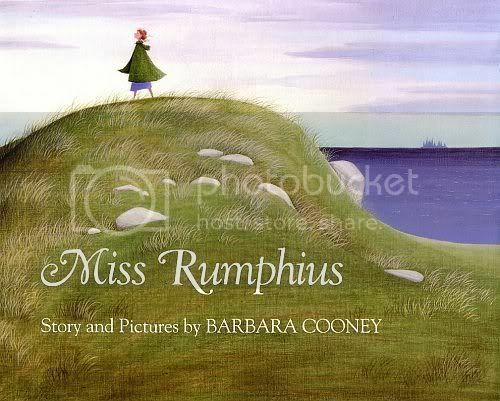 It should inspire and transport us to a world of harmony and peaceful beauty as nature intended.” And finally, one of my family's favourite and one we have in our own collection, Miss Rumphius, written and illustrated by Barbara Cooney. “What is that?” asked Alice. “You must do something to make the world more beautiful,” said her grandfather. “All right,” said Alice. But she did not know what that could be. In the meantime Alice got up and washed her face and ate her porridge for breakfast. She went to school and came home and did her homework. 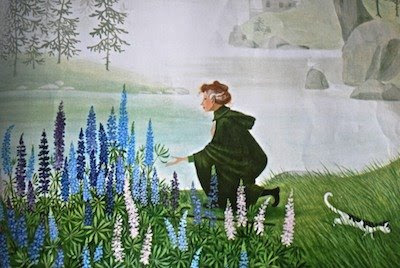 And pretty soon she was grown up..."
She became known by all as the Lupine Lady as she planted fields of lupines over the years to make her world a more beautiful place.